John Lennon: Heavy Metal Pioneer! Over the last few years there have been two artists that have claimed to have created the famous Heavy Metal "devil's horns" Hand Signal: Ronnie James Dio (Black Sabbath) and Gene Simmons (KISS). You know the "devil's horns" signal? It is the universal heavy metal sign for "you rock", usually used in unison with the music at heavy metal concerts. Not to get satanical or anything, but the sign is supposed to represent the sign of the beast, with horns represented by the index finger and pinkie raised. If you raise both hands with this sign, the band "really rocks!" That are two heavy metal rockers from the '70s both laying claim. Ronnie James Dio claimed to have created the gesture before joining Black Sabbath in 1978. Gene Simmons also claims credit, writing in his 2002 autobiography that it was the bass-playing demon of KISS that created the international heavy metal symbol. So there is no evidence that the symbol was created earlier than the '70s...or is there?! We have discovered irrefutable photographic evidence that is was none other than Beatle John Lennon that created the famous sign in 1967. Furthermore, it was even used in animation for the Beatles YELLOW SUBMARINE (just check the original vinyl album cover). These are two photographic images that can be tied down to specific years PRIOR to the '70s. 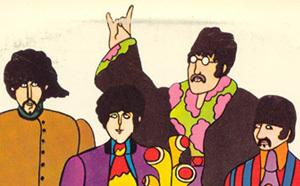 The photo of Lennon giving the sign appeared in one of the first Beatles pictures in which the band promoted the upcoming YELLOW SUBMARINE animated movie. Since the Beatles changed appearance often and were one of the most photographed icons of the '60s, it is possible to date the photo between June and October of '67. YELLOW SUBMARINE was being animated between '67 & '68, so the cartoon image of John flashing the heavy metal sign can also be verified date-wise. 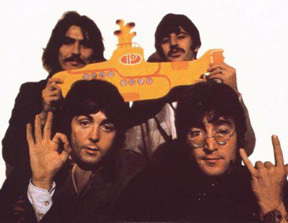 Although the film YELLOW SUBMARINE was released in 1968, the vinyl album (on which one can clearly see Lennon displaying the sign) was not released in the U.S. until 1969. But that is still years before Ronnie James Dio or Gene Simmons! What other ties does Lennon have to heavy metal? Well, he claimed that the Beatles song, "Ticket To Ride" was "one of the earliest heavy metal records ever made". How fitting that it was Lennon who also created the best-known symbol of heavy metal! "John Lennon - YOU ROCK DUDE!"! It is funny how many people took this page seriously. Especially when it was specifically listed under "parody"! And yes, we do know that John Lennon is showing the sign-language for "I love you" - remember, the picture was taken around the time of the Beatles mega-hit "All You Need Is Love" (hence the "love" theme). I had a feeling that we might get a few e-mails from some pissed off metal heads, but I had no idea so many people would take this parody seriously! P.S. - I've also been informed that this gesture has an Italian meaning, but I'm not gonna touch that one!